Here’s a chance to experience India in its homes, an opportunity to live in Punjab with the locals and experience the famous Indian hospitality! 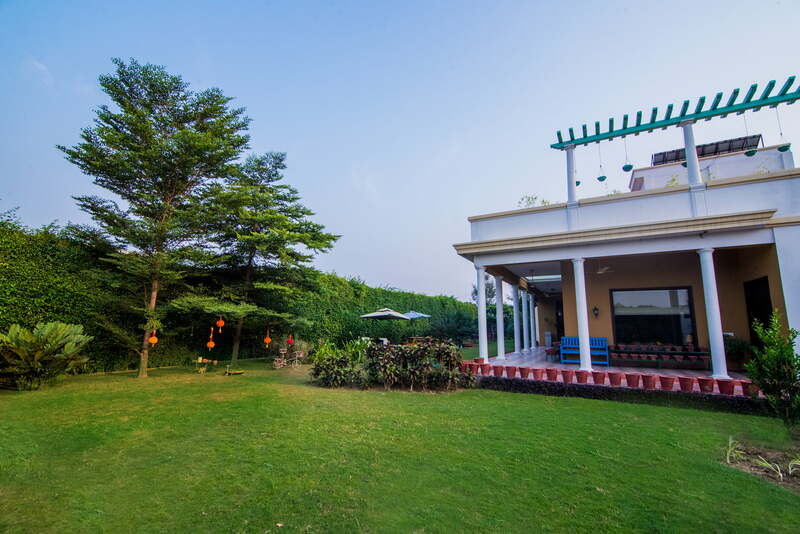 Windsong, a boutique bed and breakfast located amidst the bright yellow fields in the holy city of Amritsar. A picturesque retreat with lush gardens and a tranquil poolside to soak up some sun! So if you are looking for the Best B&B in Amritsar, you might want to take a look at this! With the right amount of happy vibes, it’s more than just a homestay; it’s an experience. Enjoy a quintessentially Punjabi breakfast prepared with fresh handpicked ingredients and lots of love by their home cook enjoyed with folk stories to leave you with memories that last a lifetime! Shrug off the outside world and retire in the timelessly decorated rooms and suites named after the five rivers of Punjab. Enjoy all the modern amenities along with those special homely touches, that encourage you to rest a little bit longer. Staying here gives us the opportunity to explore & learn about the rich culture and heritage of Amritsar. Punjab is also famous for its food so treat your taste buds through guided gastronomic tours and culinary workshops to experience the authentic flavors of Punjab. At Windsong, in the midst of bright yellow mustard fields, life flows at a different pace. Don’t we all just love striking the signature Shah Rukh Khan poses in the mustard fields?? Well staying here gives us a chance to do that! A picturesque retreat with lush gardens perfect to laze and soak up some winter sun! So what do you do while staying here? Wake up to birdsong and start the day with a leisurely cup of tea in comfortable garden loungers to experience a small taste of untouched nature. Followed by a wholesome breakfast, made with fresh handpicked ingredients and prepared with lots of love by the home cook. Laze around in the drawing-room decorated with beautiful paintings and handpicked curios. Curl up with your favorite book in a cozy reading nook next to the fireplace with an evening glass of wine. Relish delicious home cooked meals by a warm bonfire under the garden canopy or in the dining area. Punjab has a rich collection of arts and crafts, which highlight the splendor and glory of the eras gone by. Being in Amritsar is an excellent opportunity to visit the local handicrafts and souvenirs of Punjab. You can observe the Punjabi artisans who are highly skilled in their profession. Punjabi food, like its people, it’s very colorful and rich. Amritsar is known the world over for its yummy kulchas & fried fish that you just can’t ignore. Plenty of sights to see in Amritsar and the Golden Temple is a must visit for those coming here for the first time. The city is the spiritual and cultural hub for the Sikh religion and a great destination for pilgrims and tourists alike. Learn the secret methods of simmering, frying, searing and much more to create sumptuous Indian dishes in cooking workshops or spoil your senses and indulge in a decadent massage at their spa! Get a glimpse of the village nearby and their impeccable hospitality with curated village tours and tractor rides. Then there’s also the yoga sessions in the gardens or by the pool! A perfect place to escape the hectic pace of modern life. We assure you will leave Amritsar revitalized and with memories that last a lifetime. The hosts Ritika & Vivek Sehgal stay in the same premises along with their two kids Prerna & Jai; 5 dogs and a gorgeous horse. Vivek is a movie buff with a passion for music and gardening! Join him for a glass of wine in the evenings and enjoy some music from his handpicked collection. Ritika is a homemaker with a passion for cooking and interior design. You will find her around the property making sure everything is perfect and convincing you to have another glass of lassi! Prerna lives in a world of cheesy Bollywood movies, caffeine, and food! When she’s not creating new social media strategies for her clients, you’ll find her looking up new places to eat or travel to! She’s your “Go-To” girl for chirpy gossip, local advice or an impromptu cupcake! Jai is an animal lover and an equestrian enthusiast taking care of his family run business. In his free time, you’ll usually find him with his 5 dogs or riding his horse next door. And he sure will be happy to give you a lesson or two! Check out their website for more pictures!